SELVAGGIO BLU TREK: HOW TO PACK YOUR BACKPACK! Deciding how to pack your backpack is always a hard choice. Limestone, vegetation and temperature are the three major elements to take into account when you organize the best equipment for the Selvaggio Blu trek. This post is meant to help you with this challenging task: you won’t find a list of all the stuff you need to bring along. Here is an analysis of this rough territory and the necessities it imposes, based on the experience of the guides of the company Explorando Supramonte, who walk the trails of the Eastern Coast of Sardinia every day, leading expert trekkers and hiking enthusiasts along the Selvaggio Blu trek. Here is their valuable advice. Walking all day on rough terrain, scramble, rappel…choosing the right backpack is vital. First find a pack that fits your body well, then prefer those which have a good ventilation system, as temperatures could be very high. As for capacity, we suggest 35/40 l.
We usually prefer FINISTERRE backpack, available in 38, 48 and 40 l for Ladies. Long and resistant trousers are strongly advised, if you don’t want to scratch your legs since the first day: Juniper, Mastic and Mediterranean Smilax are constantly around the Selvaggio Blu trail and sometimes, when the trail is not clear, you may need to walk in the bushes, their sharp branches and thier thorns. We advise ELGON PANTS, unisex trousers, heavy-duty but comfortable, thanks to an excellent two-way stretch. Since the Eastern Coast of Sardinia is in the shadow after midday, in windy days, a windproof jacket is absolutely necessary, especially during rappels. Our favourite Ferrino product in this case is HOSTE JACKET, a light non-bulky softshell. Keep it with you in case temperatures go down or wind arises. 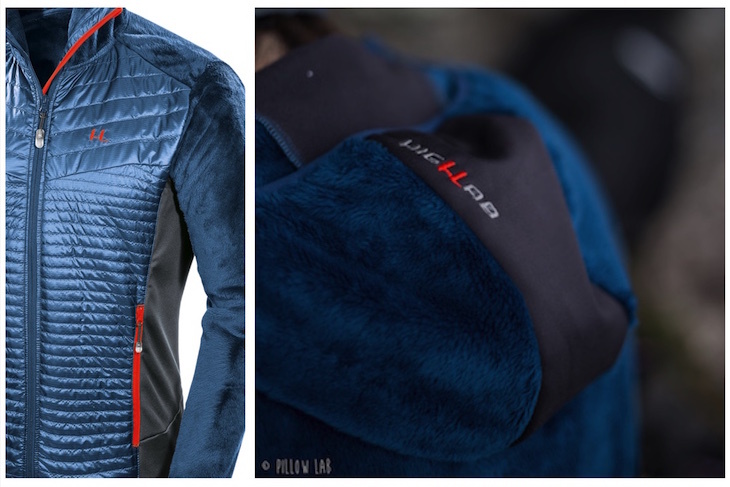 If you decide to start the Selvaggio Blu trek in early Spring or Fall, additional heavier clothing may be useful, especially in the evening, when temperatures go down. MALATRA by Ferrino is a great multi-season thermal jacket for this purpose. The whole island but this area of Sardinia in particular, enjoys a very stable climate and the sun shines almost all year. Nevertheless, don’t forget a waterproof jacket which can be very important in case of bad weather. We always take with us KUNENE JACKET, waterproof to 20.000 mm, ultra-light and not bulky. After a soft start, around Pedra Longa, in the middle of the Mediterranean scrub, on a mainly dirt ground, conditions change rapidly. The more you climb, the rougher the limestone becomes; the further you go, the harsher the vegetation gets. In some stages, you walk for kilometres on limestone pavement: flat, incised surface, sometimes with blades of rock, insidious and demanding constant concentration. For this particular aspect, it’s absolutely necessary to wear very resistant shoes, robust but lightweight, better if high cut for excellent support. A Vibram rubber outsole would be perfect, providing good grip for the short climbs of the Selvaggio Blu trek. Your tent should be light, to protect you from humidity and mosquitos, rather than cold. We frequently choose ATOM TENT for 2 or 3 people. Since temperatures are usually high, a light sleeping bag is enough, like Ferrino’s LIGHTEC 550. A mattress is indispensable, as you’ll often sleep on stony ground. SWIFT mattress by Ferrino has proved to be great for good sleep, even on pebbled beaches. Don’t forget stove and dishes for your delicious dinners. If somebody assists you with logistics, a water resistant bag is necessary, like SPORT BAG or SEAL BAG 60. Stay connected with our pages, to discover our best Italian Treks, first of all the Sevaggio Blu trek and its untamed nature.